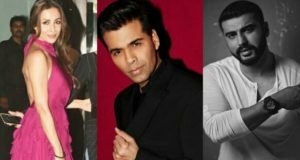 ‘Koffee with Karan’, a talk show hosted by renowned Bollywood movie producer, Karan Johar, always makes news for it’s revelation of celebs’ insights. A Bollywood celebs’ chit-chat show that invites B-town’s famous personalities like celebs, singers, dancers and other to talk on various rumour and past. It’s a widely watched show, primarily, for the entertainment … Continue reading Karan Johar confirms Malaika Arora and Arjun Kapoor Dating each other?